In a Marketplace report last night, Dan Bobkoff describes the excitement of new crops for global farmers without overstating the power of any single new crop to transform the world. To communicate this balance of opportunity and realism, Bobkoff chatted with my fellow Tufts economist Will Masters. Masters is chairman of the Food and Nutrition Policy Department in the Friedman School of Nutrition at Tufts. He says more often than not, so-called miracle crops like moringa or breadfruit are distractions. "Why [is] it that it didn't get identified as a huge success previously?" In other words, it's not like farmers haven't tried many of these crops before. Farmers experiment. They'll plant something new, and see how it does. And, over the years, many of these so-called superfoods failed for the most mundane of reasons. They take too long to grow, require too much labor or are prone to pests. It's not as easy to spread breadfruit as wheat. "That search across all the available biodiversity has been going on for thousands of years," Masters said, "and it's led to a system that has found a half dozen or dozen major species that feed the world. And that's because those major species have some pretty amazing characteristics." In Mother Jones this week, Kiera Butler has a striking report about the food industry presence at a conference of the California Dietetic Association. The description of attendees consuming and discussing their free McDonald's salads makes the association seem careless with its valuable public image and credibility. One might ask, how on earth could dietitians ally themselves with major fast food chains, instead of with advocacy groups -- or hard-hitting magazines -- that seek to better represent the public interest? Part of the answer, surely, is that the food industry provides funding to the dietetics associations. This is the answer Mother Jones might emphasize. Another part of the answer is that the food industry publicly endorses the best judgment of dietitians and nutrition scientists on the leading diet and health questions of the day. Actual products may not follow this judgment, but the industry's public communications are deeply respectful of the profession. Industry representatives endlessly tell the profession, "We listen to your advice, while those would-be do-gooders in the public interest community foolishly pursue one nutrition fad after another." For example, consider the claim in the Mother Jones article that mounting scientific evidence shows that "high-fructose corn syrup prompts more weight gain than other sugars." The article links to this four year old 2010 press release from Princeton University, which imprecisely summarizes its supporting scientific journal article (.pdf), which in turn has been strongly criticized by NYU's Marion Nestle, who is quoted as a trusted authority in the same Mother Jones article (! ), and who further links to a more detailed evisceration of this research. It is fine to criticize high-fructose corn syrup (HFCS) along with sugar, because of strong evidence that both are associated with risk of weight gain. But the current evidence does not support Mother Jones' claim that HFCS prompts more weight gain than other sugars. That claim -- and more specifically the casual and uncritical link to the Princeton University press release -- plays into the industry's strategy for befriending dietitians. Writers and advocates who care about the public interest really can persuade the dietetics profession to adopt a more independent and skeptical stance in its relationships with the food industry. We could begin by avoiding these failures in summarizing the best scientific evidence. 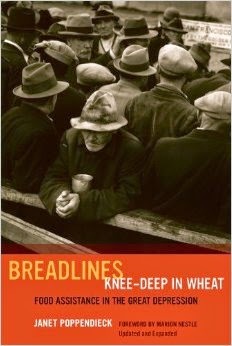 Breadlines Knee-Deep in Wheat is a classic in the history of U.S. food policy, written by sociologist Janet Poppendieck, focused on the connections between agricultural crisis and food programs for the poor in the Great Depression. The new edition from the University of California Press, published this month, includes a foreword by Marion Nestle and a delightful new epilogue bringing the story up to date from the book's original publication in the 1980s to the present. And by "the present," I mean the book includes material as recent as the key January 2014 compromise over the Supplemental Nutrition Assistance Program (SNAP) provisions new Farm Bill. (In terms of the publishing mechanics, how is this even possible?). The book is well-written and detailed, making bureaucratic correspondence come alive as lively argument. It has an authoritative and believable voice, while still carrying passion for the plight of the poor and hungry. I knew this already from reading Poppendieck’s more recent books on the emergency food system and on school meals reform. The pig slaughter story will stick in my head permanently now. The use of archival material adds novelty, but the book serves well even digesting and interpreting known topics. 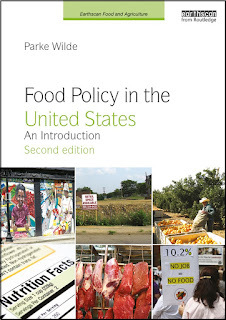 Immediately today I will add this book to my U.S. food policy syllabus and place an order request to my university library. The new documentary movie Fed Up, by Stephanie Soechtig, will be released widely tomorrow. It rightly focuses on sugar consumption as a key contributor to chronic disease in the United States. If you see this movie and want some links to reliable information, here is a quick rundown of both the diagnosis and the potential solutions. Mainstream sources agree with the movie that sugar consumption is a problem. Based on an exhaustive review of the balance of evidence in the scientific literature, the federal government's Dietary Guidelines for Americans plainly recommends that Americans reduce their consumption of calories from added sugars. Fed Up's broad indictment of sugar is endorsed by the movie's most reliable interviewees, such as former FDA Commissioner David Kessler. Sugar is not consumed in the abstract -- it comes from particular foods. As noted in a "Sugar 101" primer from the American Heart Association, the leading sources of added sugars in our diet include soft drinks, baked goods, candy, and ice cream. Americans would live longer and have better health if we reduced consumption of these foods. Unless you are prepared to critically evaluate the complex scientific literature, it is optional and not necessary to buy in to a variety of specific scientific claims about sugar. Among the interviewees in Fed Up's trailer, which I watched today, I have heard nutrition scientist Robert Lustig focus more narrowly on fructose, and I've heard Gary Taubes more broadly criticize all carbohydrates. I personally find the sources cited in #1 above more persuasive than either Lustig or Taubes, but who knows? Either or both of them may turn out right. It doesn't matter for the basic indictment of the foods in #2 above. Some people blame marketing, and others blame federal subsidies. The influence of marketing is real, while the subsidy story is generally unconvincing. To understand how federal subsidies affect corn syrup, for example, one must pay attention not just to price-suppressing corn subsidies (which have been tiny in recent years anyway), but one also must pay attention to corn-based ethanol policies that have made corn syrup more expensive. I think critics of "subsidies" mostly have not taken the time to learn about specific subsidy programs, but rather are expressing -- correctly -- their recognition of the longer term impact of the industrialization of the food system. Regardless, the specific blame doesn't matter much. However we assess the relative contribution of these factors, we should always remember the more fundamental fact that will remain with us even if marketing policies or subsidy policies are reformed: products with sugar are sweet and people desire them. That's the big source of our challenge. Tax. Jenny Hopkinson and Helena Bottemiller Evich report that, in connection with the premier of Fed Up, some in Congress are expressing renewed interest in a tax on sugar sweetened beverages. USDA research shows that an increase in the price of these beverages likely would make a considerable difference on consumption. It is true that part of the gains -- but only part -- would be offset by increased intake of other caloric beverages that substitute for the beverages that are taxed. It is also true that higher beverage prices would be regressive (affecting low income folks relatively more than high income folks). Finally, the most important thing about a tax is that it political death to seek to tax, as if taxes were a good thing. The only politic way to pursue a beverage tax is to institute it as part of the Congress' unavoidable responsibilities to fund essential government services (such as military and roads), reduce the deficit, and seek to balance the budget. The sound argument is, "so long as we are reluctantly compelled to institute a small sensible tax on something, we might as well save some public health expenditures by placing the tax on sugar sweetened beverages." The food environment. I think it is time for schools, offices, restaurants, and all sorts of public venues to revisit their role in making sugary foods -- and especially beverages -- available to excess. At one time in the past, somebody might have seemed overwrought or joyless for enforcing limits on bake sales in schools, for example, or an occasional fast food meal as a reward for good school performance. But, decades into the current nutrition dilemma, I think we should be more grateful and supportive of those who propose holding a firm line on making the food environment healthier, especially for our children. Improving nutrition assistance programs. First, nobody should even contemplate any part of solution #3 unless they also are boldly supporting proposals in #1 and #2. It is poisonous to discuss improving changes to nutrition assistance programs for low-income Americans unless we are firmly on the record supporting corresponding changes in the food environment for people of all income groups. Second, any proposed improvements should incorporate input from anti-hunger advocates as well is public health advocates, and they certainly should draw on input from program participants themselves. If bold new nutrition assistance program options are pursued on a pilot scale, we may be surprised at the response from program participants.